Co-production is a key part of the cooperative council. Co-production challenges the traditional way of providing public services. 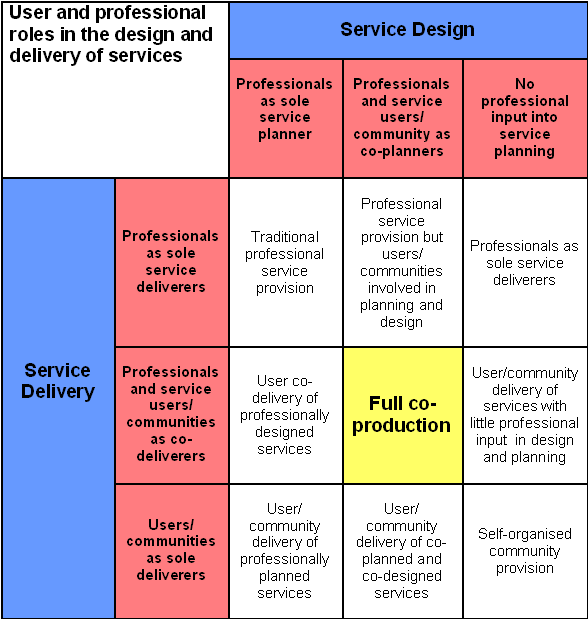 It is the process that literally turns services users from passive recipients into active shapers of public services because it means involving all stakeholders, including the people who use a service, in the process of determining what services are delivered and how they operate. Another term that is often mentioned is co-design. This is where the service is designed collaboratively with service users, local residents, service providers and professionals. However it may still be delivered by professionals rather than on a collaborative basis. Think Public have produced an excellent short video explaining what co-design is and how it can work. Define service users and the community as assets who have skills that are vital to the delivery of services. The co-operative council vision puts service users and the local community at the heart of public service design and delivery, appropriately valuing their knowledge and skills in producing public services that best meets local needs. Include anything that people do to support each other in the definition of work. If it is co-production, then it will actively break down the divisions between professional and client, between service provider and service user, between work and volunteering. Include some element of reciprocity. Reciprocity ensures that people are actively involved because they are themselves being supported, and because we have a basic human need to give and take. The opportunity to feel needed and valued by others can play an important role in increasing self-esteem, personal aspiration and a sense of purpose. One example is timebanking, where what people do to help is recorded and rewarded, and entitles them to help from others. Build community capital. The core of co-production is that it allows public services to play an active role in building and sustaining networks and support. The ability of neighbourhoods to keep people well, bring up children and prevent crime has been described as the ‘core economy’ – the operating system of society which makes everything else possible. Co-production is about growing the core economy. Support resilience. Developing the resilience of individuals and communities is about creating personal experiences upon which people can base future decisions. This requires opportunities for people to learn and take calculated risks that they can then learn from. To do this constructively, people need supportive networks around them. Current structures limit people’s opportunities to experiment for fear of the consequences of failure. However, without these supported opportunities people may fail to develop the frames of reference that will make them more resilient and less reliant on public services in the longer term. New Economics Foundation have produced an interesting video to explain more about co-production. 5 Responses to What is co-production? At the most simple level, co-production is about involving end users in researching, designing and implementing a service. There are a number of excellent websites and resources out there with ideas and methods to help do co-production. One of the best that I have come across is Dott Cornwall’s method bank which neatly details the various stages of co-production and offers a variety of tools and case studies- http://www.dottcornwall.com/design-matters/design-methods. A local example of co-production in action can be seen at Mosaic Clubhouse http://www.mosaic-clubhouse.org/services.asp who will also be attending the up an coming leadership network co-production event. I would be happy to have a chat about any of this and will post more about co-production in the coming weeks. I thought I would highlight a really great example of how the internet and crowdsourcing can be used to co-produce solutions to challenges, hello OpenIDEO http://www.openideo.com/. OpenIDEO is an ‘open innovation platform’ that brings together a global online community to help tackle big challenges to help public good by crowdsourcing ideas and prototyping solutions. Crowdsourcing in essence is a way of tapping into large groups of people to find solutions to challenges. Lots of organisations are already using crowdsourcing as a way of getting ideas from the public on new products or in the case of the NHS on what applications could be designed to improve health care in the future http://mapsandapps.dh.gov.uk/. Dell are using crowdsourcing internally to source new product ideas from their staff and customers http://www.ideastorm.com/. I think that crowdsourcing could be a really interesting way of helping to co-produce solutions to some of the Cooperative Council challenges out there- what do you think? They also did an interesting 5 country report, commissioned by the EU/French government, “If you want to go fast, walk alone. If you want to go far, walk together.” http://www.govint.org/good-practice/publications/if-you-want-to-go-fast/ It contains some good observations about the barriers and benefits of co-production, and the UK was one of the countries included in the research.